The sixth annual Dallas Art Fair, presented by Ruinart Champagne, will feature 93 international galleries from April 10 to 13. The fair will return to the Fashion Industry Gallery (f.i.g. ), located at 1807 Ross Avenue in the dynamic Downtown Arts District. 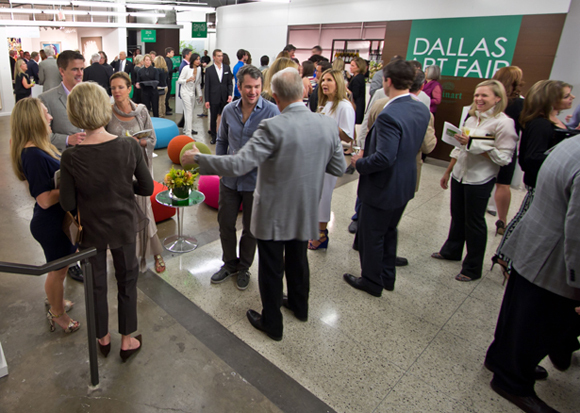 The Dallas Art Fair will once again open on Thursday, April 10 with an exclusive preview gala to benefit the Dallas Contemporary, the Nasher Sculpture Center, and the Dallas Museum of Art. The gala offers patrons and top collectors the opportunity to preview and purchase exhibited works prior to the public opening of the fair. The 2014 edition centers the official Dallas Arts Week inclusive of major exhibition openings and art-related programming in Dallas. The expanded week will launch with MTV RE:DEFINE, a benefit in support of the MTV Staying Alive Foundation and the Dallas Contemporary on Friday, April 4. A comprehensive overview of the cultural revitalization of Dallas will be presented by the American Federation of Arts with ArtViews Dallas Cultural Districts: A Rising Tide at the Dallas Museum of Art on Saturday, April 12.
Notable exhibitions include Julian Schnabel, Richard Phillips, and Paula Crown at Dallas Contemporary; Fredrik Vaerslev at The Power Station; Bettina Pousitchi at the Nasher Sculpture Center; Thomas Lawson at the Goss-Michael Foundation, and Robert Smithson, one of several exhibitions, at the Dallas Museum of Art.